Need to send an email with your latest updates? Maybe you have a new home for sale and want to email your active buyers? Or maybe you just simply want to give a warm seasons greeting and wish them well. 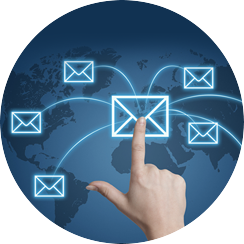 Our email marketing system can save you time and money by allowing you to stay in contact with those that matter to you most. A newsletter is a practical medium for building and nurturing relationships with clients and prospects. It gives you the opportunity to raise awareness and understanding of your company, your services and your properties. Don’t let your clients slip through the cracks. They need constant reminders of who you are, what you do and how your business means to them. Let our Drip eMail Marketing tool steer the wheel for you. Stay in contact with all of your leads and clients with a few clicks of a button using our powerful email marketing platform. Drip email marketing campaigns engage your prospects and clients with a series of email messages delivered at scheduled intervals. With active correspondence, you will eventually learn about their needs and interests, thus helping you tailor-fit your next approach. With Intagent, you can create email campaigns for your clients and prospects using our straightforward automation system that helps you run them with less resource and effort. Your business is also our business. Making it easy for you to stay in touch with your clients and prospects is our one of our primary objectives.